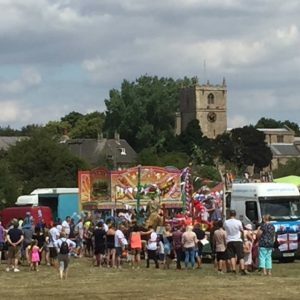 On a day which saw temperatures soar, thousands of people headed to the Carrs showground for the annual Warsop Carnival. Big Warsop provides support for the Carnival to help local groups reach out to the wider community and raise much-needed funds. The dog show – which included 10 categories – was a popular spectacle later in the day, as was the adults’ 5-a-side football tournament. Four teams entered and it was a penalty shootout showdown which ended with the “Crates and Grapes/Wine Bar” being crowned the winning team just ahead of “The Talbot” who came 2nd. Sports4Kidz provided t his and a range of other children’s activities throughout the day. One of the most popular attractions was the mobile beach area which the Carnival team decided to put under a marquee due to the heat. Families enjoyed the sandpit and many adults also enjoyed having some shaded area along with a beer or two from the bar which was provided this year by the Plough Inn. People also enjoyed admiring a couple of classic cars which were showcased on the day, as well as the extremely popular annual flower tent and duck race. Over on the music stage, Nigel Pinnick started the day off with a “Best of British” themed DJ slot followed shortly after by Charlie Starr who peformed some “Best of British” classics before coming back on stage as an incredible tribute to the late Amy Winehouse. Once Charlie had peformed as Amy Winehouse, the Carnival Chair (Luke Spence) took to the stage to reveal the results of the Warsop Carnival raffle which had over 20 prizes donated by local businesses and individuals. Once the raffle was complete, the brilliant “Ed Sheeran Experience” then took to the stage. As always, the Warsop Carnival was organised by a group of volunteers. The committee would like to welcome new members to assist with helping out either prior to the day or on the day itself. If anyone would like to join the committee, please either email warsopcarnival@yahoo.co.uk or phone Luke on 07552219947.